NFL Fairway Stand Bag (Select Teams Available) - $139.95 - GolfersEdgeOnline.com - Best Golf Equipment On The Web! 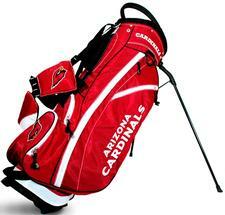 Get a lightweight, versatile golf bag that shows off your team spirit with the Team Golf Fairway Stand Bag. This bag has it all: 14-way full-length dividers, five zippered pockets and two-lift assist handles. There are also several extras to enhance your day on the course, including a cooler pocket, valuables pouch and a towel ring. A removable rain hood and umbrella holder keep you dry when the dark clouds roll in. If you have any more questions about the NFL Fairway Stand Bag (Select Teams Available); do not see the model you are looking for; need custom options; or prefer to not purchase online, then please call us at (630) 656-1291.